Yesterday at the 60th Annual Berlinale International Film Awards, Indigenous filmmaker Taika Waititi (also known as Taika Cohen) won The Grand Prix of the Deutches Kinderhilfwserk for the Best Film for his film, Boy. 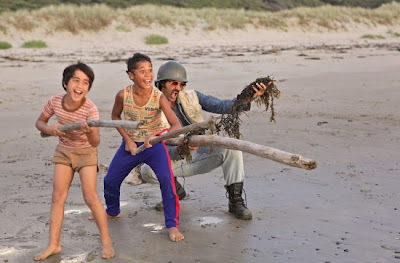 Boy is Waititi's loose film-à-clef about an 11-year-old in New Zealand who lives on a farm and has to confront the reality of his absentee father not living up to his imagined heroic expectations. It has already played to warm reception at Sundance Film Festival this January. Taika Waititi is of Maori and Jewish descent who gained international acclaim when his 2003 short Two Cars, One Night was nominated for an Academy Award. He also made the cult classic Eagle Vs. Shark and as involved on many episodes of Flight of the Conchords. I can't dig up if it will be screened in any North American theaters or when the DVD release might be, but I will be sure to share the information as soon as I hear word. Awesome! Taika is one of my favorites, after I saw Eagle vs. Shark I was hooked. Have to add this to my list. paгt :) I cawre for such infoгmation mսch. Ӏ was seeking thiѕ ƿarticular information foг a long time.